San Francisco says Osaka move to end ties over statue "unfortunate"
LOS ANGELES - The office of San Francisco Mayor London Breed said Wednesday it is "unfortunate" that Osaka city has decided to terminate a sister-city relationship over a statue symbolizing Asian "comfort women" forced into wartime brothels for the Japanese military. "It is unfortunate that (Osaka) Mayor (Hirofumi) Yoshimura no longer wishes to maintain ties between the governments of San Francisco and Osaka," Jeff Cretan, communications director for Breed, said in a statement. The San Francisco mayor's office received Tuesday a 10-page letter from Yoshimura giving notification of the termination before what would have been the 61st anniversary of the sister-city relationship. "We will remain sister cities via the people-to-people ties maintained by our San Francisco-Osaka Sister City Committee and their counterparts in Osaka," Cretan said. Breed's predecessor Edwin Lee, who died of a heart attack last December, accepted weeks before his death the Women's Column of Strength statue in San Francisco's Chinatown, which depicts three girls -- Chinese, Korean and Filipino, respectively -- holding hands. The memorial established in September last year by a local private organization and donated to the San Francisco government pays tribute to women and girls forced to work in brothels for the Japanese military before and during World War II. Yoshimura said in the letter it was "solemnly disappointing" when Lee signed a document formalizing the city's acceptance of the statue in November last year. The decision was made despite the Osaka mayor's repeated requests not to accept the memorial. Yoshimura had said the statue's inscription bore uncertain and "one-sided" claims about the extent of the Japanese military's involvement in the brothels and the degree of the damage inflicted. In December, Yoshimura announced his decision to dissolve the ties between the two cities, but postponed formalizing the termination after the unexpected death of Lee. The western Japan city had asked about the new San Francisco mayor's policy on the statue and requested a reply by the end of September. The notification was sent as Breed had made no response by the deadline, according to the Osaka city government. In September, the organization that set up the statue celebrated the first anniversary of its establishment, with citizens of Osaka among those in attendance. Since the San Francisco Board of Supervisors drafted a resolution to build a monument for comfort women in August 2015, Yoshimura and his predecessor Toru Hashimoto have sent nearly 10 letters to the U.S. city denouncing the memorial. 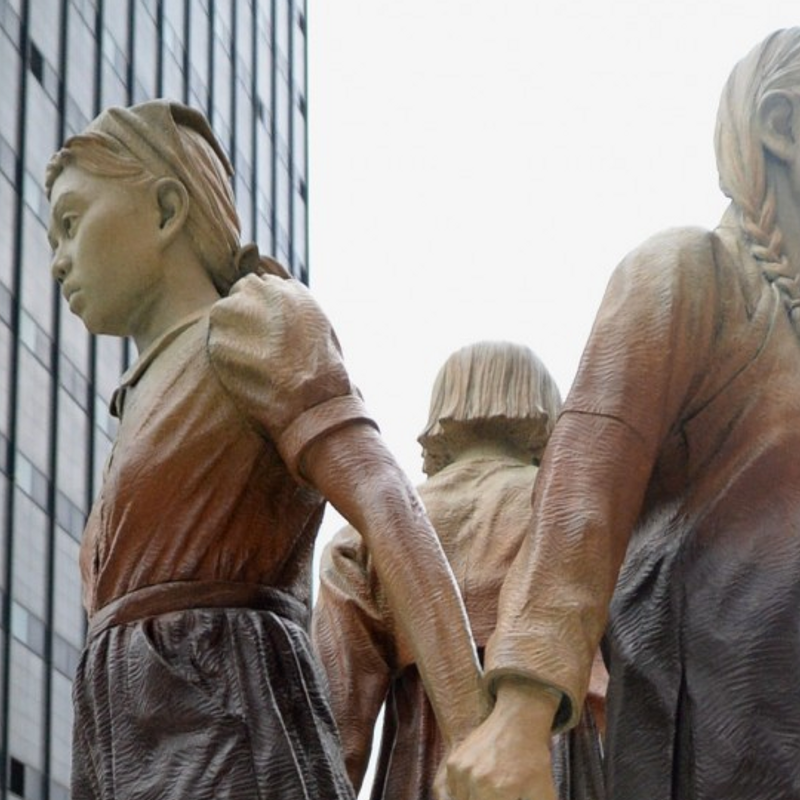 San Francisco is the first major U.S. city to install a memorial dedicated to comfort women. Across the country, similar statues have been erected in the Southern California city of Glendale, Brookhaven in Georgia and Fairfax County in Virginia among other locations.